The Chicago-based Tribune Co.’s turnaround specialist CEO doesn’t think daily newspapers can charge for Web content. I agree. Randy Michaels – head of the L.A. Times and Chicago Tribune – does think niche publications can create successful pay models online. He’s two-for-two with me. That speaks directly to Springfield Business Journal. I was reading the hold-in-your-hands print edition still delivered by snail mail to SBJ’s office. But here’s the online version, for which WSJ may make you pay. I routed the article to our editorial team in order to emphasize this point: If we don’t continually produce unique content, we can’t successfully employ a unique pay model on sbj.net. It’s that simple. And that’s exactly where we are; our pay model goes up Sept. 1. Should it crash and burn, which I don’t think will happen based on the generous front yard before hitting our paywall and the variety of options – print, digital or online editions – for the same price, there’s always art. 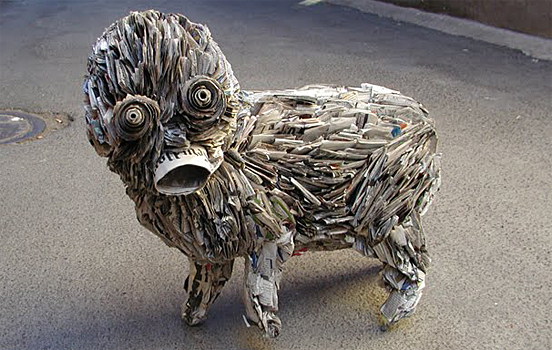 That’s some pretty impressive newspaper work by artist Nick Georgiou. Now, journalists have to get creative these days. And why not? It’d be an easy transition from starving journalist to starving artist, with pounds upon pounds of archived print editions with which to get creative.